I had such a good time kayaking on Sunday afternoon, I had to shoot my boat afterwards! (see photo) Dianne and I found Sunday's windless and sunny conditions impossible to resist. 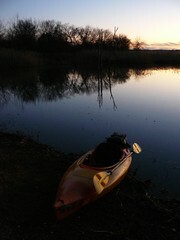 We got a late start, but still managed to enjoy a couple of hours of fine winter paddling on Dripping Springs Lake. We got to test out some new paddling gear. Both of us had some new cold water paddling gloves to try out and I was trying out some motorcycle rain gear. Motorcycle rain suits offer some cool benefits for winter kayaking: they are waterproof, windproof and made to pull over whatever you are wearing. Also, they are cheaper than any drysuit you will find. I found the rainsuit pants worked well, but the rainsuit top was too noisy. Since I like trying to sneak up on raptors and stuff in my kayak, I can't really do noisy. The cold water kayaking gloves I had on were made from neoprene and polar fleece. Get some, they rock! Dianne had some new kayaking gloves too, but didn't find much need for them as we added some Yakgrips Kayak Paddle Grips (great product!) to her paddle. Unless it is much colder, her Yakgrips alone are fine. I tend to muck about more in the water, so I prefer gloves. Your mileage may vary...the important thing is to get out there and chase some sunsets! For Kayak Photography, I like to put in the kayaks right by the fishing dock at Clovis Point on Dripping Springs Lake. I paddle out from the shore and then due West across the lake. On the West side of the Lake, I shoot the sunset until it starts to fade out and the shade makes me cold. Then, I paddle Eastward back the way I came across the lake, quick as I can. After just a couple minutes of paddling, I turn the kayak back around to the West and I see...another sunset to photograph! I can usually do this at least three or four times an evening, gaining another sunset each time. It may sound goofy, but I manage to have a blast doing this everytime I try it. I get some excercise, some photo hunting and even the occasional bit of wildlife viewing. 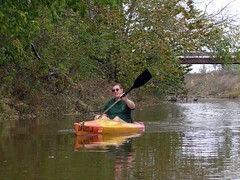 Best of all, I can repeat the process on any of the vast number of Oklahoma lakes that dot the Sooner State landscape. I can't wait to see them all. Happy Paddling! Kayaker gloves are ideal for any water adventure including kayaking, canoeing, and rafting. They also work great gripping the handles of recreational water craft or water ski tows. Chota and Stearns are both popular brand names for canoe & kayak gloves. Thats a great spot for chasing sunsets, and it looks like you caught one too. Spotting any bald eagles around your parts these days? Yes I did, a couple weekends ago. I was headed westbound where I40 crosses Lake Eufaula, along the riprap. I saw a very large bird soaring along the southside of the highway over the water. It didn't move like any other birds I know inhabit the area. I slowed to get a better look and it was a mature bald eagle, obviously looking for a lunch time fish. About that time an eighteen wheeler and I were neck and neck on the highway. He slowed way down and I looked up into the cab and I could see the look of total awe on his face. I think that made his Oklahoma Road Trip a special one. Fantastic! I'm hoping to get a little time on the water in this weekend! Beautiful scene, i like your blog..